Gorgeous lake & golf views from stunning top-to-bottom remodeled CBS home at 9 Marlwood Lane in Marlwood Estates at PGA National. A dramatic foyer greets you through the leaded glass doors. Beautifully lined cathedral ceilings with crown. An open plan with centerpiece family room & wet bar surrounded by porcelain glass inlays. The gourmet kitchen has top-of-the-line stainless appliances, wine cooler, enormous granite counters. The game room has wood floors & dining room with plantation shutters. The master is oversized, huge California walk-in, marble bath, Jacuzzi & bidet. The den has terrific built-ins. 2 guest suites with private baths. The loggia is screened with pavers & waterfall pool. Onyx powder room, giant laundry room, extra garage space, newer appliances, roof, water filtration, and hurricane protection. 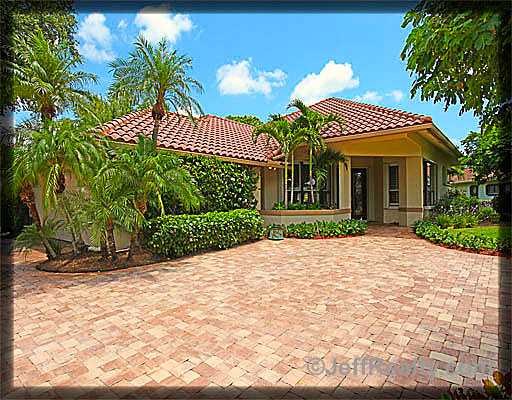 Posted in country club community, golf community, palm beach gardens homes on May 31, 2011 at 4:43 pm.